Ounas saw you as Seth saw the Two Harmonious Ones”. It seems clear that here the text is referring to the four goddesses (Isis, Serket, Neith and Nephthys) , which formed a team of four divine mourners of Ancient Egypt in favour of the dead’s resurrection. And with these goddess is mentioned the most intimate related god. Horus was Isis’ son, Nehebkau was the Serket’s son, Sobek was mainly associated with Neith as her son, although in some cases he could also be a consort of the goddess and Seth was Nephthys’ husband. However, Nephthys is not mentioned at all. In her place the scribe wrote “The Two Harmonious Ones“. 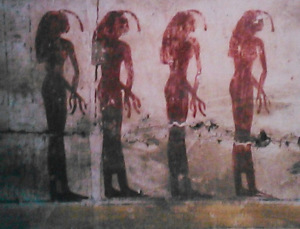 Expression which alluded the two mourners, so Isis and Nephthys. Not to mention Nephthys was something intentioned? if so, Why? The son of Serket and Ptah isn’t Nefertun? For Nephtys, i think her role is secondary because she’s just the nurse and the wife of Seth ennemy of Osiris. Hi Étienne, Nefertum was the son of Ptah and Sekhmet (not Serket). They three were the Menphite Triad. I also agree with you in the role of Nephthys. She was obviously a very important goddess among Egyptian gods. But in my humble opinion she was not at the same height of Isis.